The National aren't going to win any awards for being the most innovative band, nor will they gain any acclaim for "Most Exciting." On the contrary, their five-man standard rock band get-up is pretty much the walking template for guitar-based rock. There's no rags-to-riches story, no experimental electronic instruments, no egotistical media-hogging frontman. There's just five guys who play rock and roll. In an age where art is often judged by how many sales it can rack up in its debut weekend, it's refreshing to see a slow-but-steady-wins-the-race story. 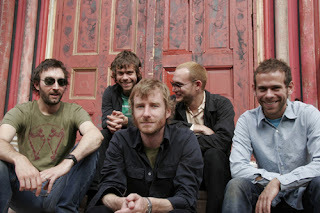 The National have been around for almost ten years, but only really started to turn heads after their third album, Alligator, in 2006, and only built steam outside of the Pitchfork crowd with 2008's Boxer. When High Violet hit the shelves earlier this summer to strong sales, it seemed the natural conclusion to an ongoing story, not some sort of fad-induced flash-in-the-pan. Their music mirrors the narrative arc of the National's career. All of their albums are growers, and it takes a while to get into the music. At first listen (all the way back last October for me), the National seemed a little too chill, a little too laid-back, a nice mellow mood without a lot of meat. But I kept them kicking around my iTunes, and they kept popping up and I liked them more and more each time I heard them. By the beginning of this summer, I was at the store on the first day of High Violet's release to hear their new stuff. This might make you think of the old joke from The Onion: "Not Very Good Album Takes A Little While To Get Into." But in spite of that barb, I do believe there are some albums that are growers, where it takes time for their work to soak in. The National produce albums like these. The mellow anthems, the subtle string and wind arrangements, the strange, often opaque lyrics only really introduce themselves after multiple listens. In a world that often caters to shock value and short attention spans, The National remains a slow-brewing alternative - not trend-setting, not in-your-face, but simply putting out increasingly solid songs with good performances. It's not going to change the history of music as we know it, but sometimes this sort of music is all you need. WHAT I KNEW BEFORE: I checked Boxer out of my local library last fall, and it languished in iTunes for a while before I really started to appreciate it. There wasn't a single moment where everything clicked, but rather a general upswing in my opinion over several months. MY LISTENING: I listened to Boxer (2008) every day this week, as well as Alligator (2006) and High Violet (2010) three times each. In case you haven't gathered, I'm quite fond of The National. As you read this, I might be driving back from their Sunday night concert in Nashville. They're one of the first bands since I've started listening to popular music that I've closely followed. Yes, I even follow them on Ping. Out of the three albums I listened to this week, Alligator is probably the rawest, and the one that rocks out the most. Both "Abel" and "Mr. November" are great upbeat pieces, with the latter being one of the best closers to any album. The National aren't really renowned for their ability to rock your socks off, but it's nice to see them turn up their amps every once in a while and prove that they've got more than just mellow ballads. But those mellow ballads are my favorite part of the National. Boxer, I think, is still the best summary of the band's skills in this regard, an album with a nocturnal aura, that speaks to people wandering through a quiet night with lights in the distance. "Slow Show" and "Start A War" are two of the albums' best - quiet, restrained pieces that show off singer Matt Berninger's deep, throaty voice. Most of the album is on this level, sounding like something from the graveyard shift or between the gaps, the forgotten parts of America that nevertheless retain their own quiet mystery. "Mistaken For Strangers" is a bit louder and more direct, but it might be the best song on the album - Berninger sings his cryptic lyrics with a passionate frenzy, and the music sounds like the band's standard mellow demeanor kicked up a notch, turning up the volume while still retaining something of that mystery. High Violet is also very good, even if it seems like an apple that doesn't fall very far from the tree of Boxer. From the hazy "Terrible Love" to the soaring "Bloodbuzz Ohio," here the group takes their Boxer aesthetic and perfects it. It's nothing that wasn't on Boxer, but it's no misstep either. Aside from their evocative moods, what I really like about The National is their subtle instrumental arrangements, always intricate but never intrusive. Listen to the strings in "Baby We'll Be Fine," the opening piano and closing brass section in "Fake Empire," the strangely restrained urgency of the soaring strings on "Vanderlyle Crybaby Geeks." The band manages to incorporate these great instrumentals without ever showing off. It's this sort of thing that takes a few listens to really appreciate, but I really think it's one of their best strengths. That, and drummer Bryan Devendorf, who manages to do some really interesting stuff while still providing a very solid backbone. Matt Berninger's voice gets a lot of the press, but Devendorf's percussion is just as essential, if not as immediately apparent. I like most of The National's output. I can accept certain criticisms - they're a little boring, sometimes a little one-note, but these don't really bother me so much. Although Alligator is considered The National's best endeavour by both the cultural arbiters of Pitchfork and ChargeShot!!! editor Rob Kunzig, I found it my least favorite this week. I liked the quietly sweeping grandeur of Boxer and High Violet a little more, and while Alligator has instances of this, it also is a little grittier, and little more down-to-earth. "Secret Meeting" and "Looking for Astronauts" are two songs that, while I don't necessarily dislike them, don't really do a whole lot for me. Finally, the lyrics of "Conversation 16" ("I was afraid / I'd eat your brains") that conclude with Beringer crooning " 'Cause Iiiiiii'm evil") constitute the one lyrical phrase from the National that I simply couldn't accept. Just way too goofy for me. FURTHER EXPLORATION WOULD ENTAIL: There's the band's first two albums: The National (2001) and Sad Songs for Dirty Lovers (2003) that I need to listen to, and I like the group enough that I probably will get my hands on both of them at some point. BEST SONG YOU'VE HEARD: "Fake Empire"
The brass at the end is excellent. BEST SONG YOU HAVEN'T HEARD: "Runaway"
My favorite song from their newest album.